My smaller inverter is a quality one, but not a pure sine inverter. I found that running the electric through a surge strip is fine enough for my computers, flat screen monitor and other equipment. I have never had a problem with "dirty" power. I have also never had an issue with charging batteries with it, as long as I run it through the power strip. I have no idea why it matters, but I am not the only one to report this. Pure sine inverters are pretty pricey and I have yet to see the need for one. My larger inverter is a Harbor Freight special. It doesn't get used very often. When I run the shop vac or a saw or anything else that needs a lot of power I use it. It has worked perfect for that stuff, but I would not rely on it for constant use. It is a 2000 watt/4000 peak inverter. Same thing with my father and grandfather. There were nights when I was away and I could swear that I could still hear the Morse code in my head lol. I just have a tech license, no code required. In fact, there is no code requirement for a general license anymore. I just haven't had the time to study for the test. Lead acid batteries are very strange--how much you get out of them depends on how many amps you draw and how deeply you discharge them. It used to be said you'd only get 200 or such discharge cycles, making them a pretty crappy investment (ie, they'd work for a couple years and then require replacement). Other chemistries usually got much better--Lithium for instance was usually rated to 2000 cycles after which I suspect testers got bored. 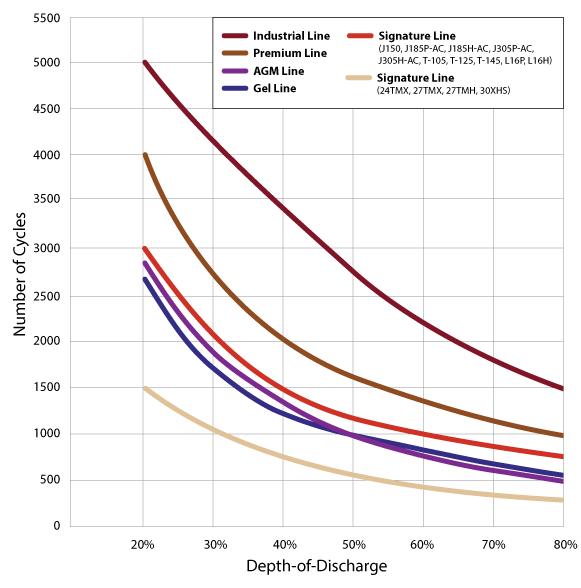 Trojan Battery didn't like that, so apparently they stepped up their research and developed better electrodes for lead acid--see this webpage (or chart) of cycle life vs depth-of-discharge. I think a few thousand cycles might last me a while. Now I just need to run the numbers to see if the fancy 'industrial' batts end up cheaper over their lifetime. You could always go with a propane fridge. Freedom from the bureaucrats = PRICELESS! Best $6400 I have ever spent!! Check out Amazon.com, some excellent resources there plus some beginner systems, you can always 'grow' a system, adding storage and panels. For running similar items to the original post, we've had a lot of luck with the Inergy Kodiak and a few panels. We currently run about 4 LED lights, a small RV refrigerator and have two outlets for laptops and phone chargers and a mid size flat screen tv. The Inergy keeps up great. From the sounds of it, we should see around 5 years out of it before needing to have the battery replaced but so far we love it. I have built several off-grid systems for yurts (and other projects). The $4k is pretty accurate, but occasionally you can get some stuff used. Feel free to shoot me a PM and I can help you get the sizing you need. And if you need a size that someone else is upgrading from, I might be able to help get it cheaper 8-).